Do you have ideas on how school life can be improved? Would you like to influence decisions taken and ideas discussed that concern the school? Do you want to connect with other parents and work towards a common objective inspired by European values? Then run for a seat on the APEEEL1 Management Committee! Every year, in accordance with the statutes, an election is organised to partially renew the membership of the APEEEL1 Management Committee. This year, eight positions on the Management Committee will need to be filled. No experience is needed. You just need to be a member of our organisation and bring your interest, passion and dedication to impact school life. keep you updated on all important and hot events and topics ̶ we publish information on the website, via monthly Newsletters and have a discussion group on our Facebook page. APEEEL-1 is a non-for-profit Association established in accordance with Luxembourg laws. Its oversight is carried out by the Management Committee which in turns elects its executive (bureau) and members of various working groups. Check our website to learn more on who we are and how we work: https://www.apeeel1.lu/. On our Home Page you will find up-to-date news. Under the ‘Working Groups’ menu you will find information on how we are organised and what issues we deal with. 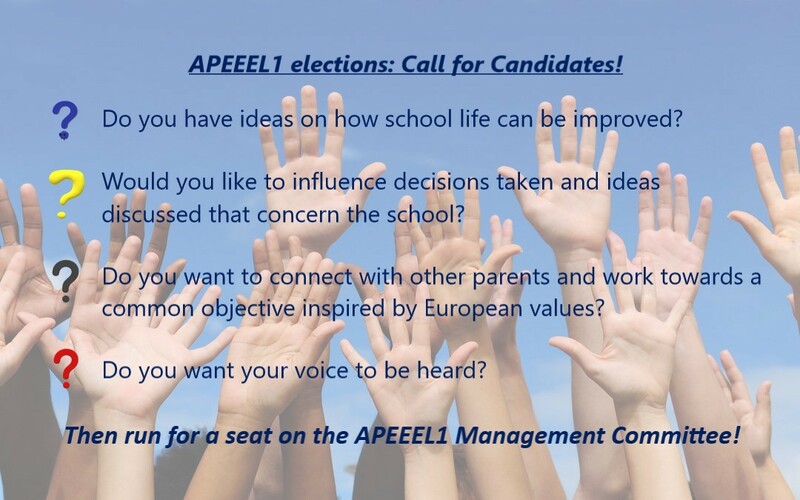 Contact our current members who will explain to you our internal organisation: https://www.apeeel1.lu/management-committee/. The elections will take place according to the rules and calendar published on our website: https://www.apeeel1.lu/election/. You can find the Candidature form here! Candidatures must be submitted by Monday 29 April 2019. If there are fewer candidates than vacancies on that date, the deadline will be extended until Monday 6 May 2019.